Many people probably thought that when Amtrak President and CEO Richard Anderson rejected a request from the United States Marine Corps. 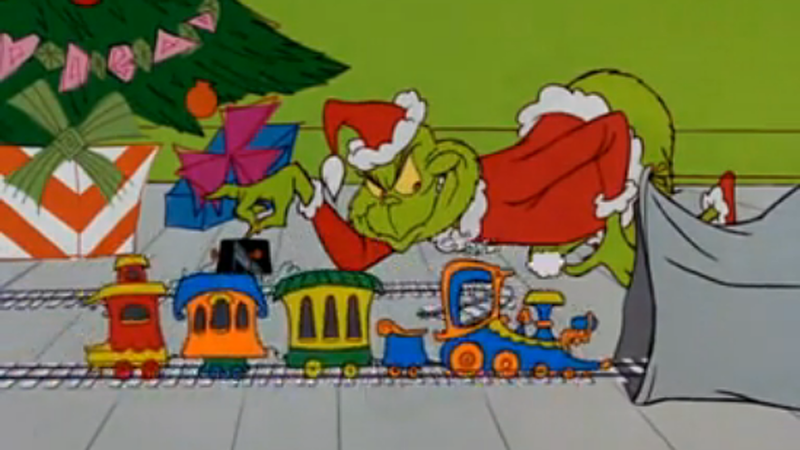 to run this year’s Toys for Tots train, a lot of poor kids would be disappointed. A modern-day hero stepped forward to save the day, aided by other heroes. 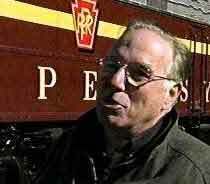 Bennett Levin, well known as the owner of two restored ex-Pennsylvania Railroad E8s and other equipment (Philadelphia-based Juniata Terminal Co.), put together a first-class train of private equipment to aid the Marines in distributing toys along the train’s traditional Southern Tier route through upstate New York. 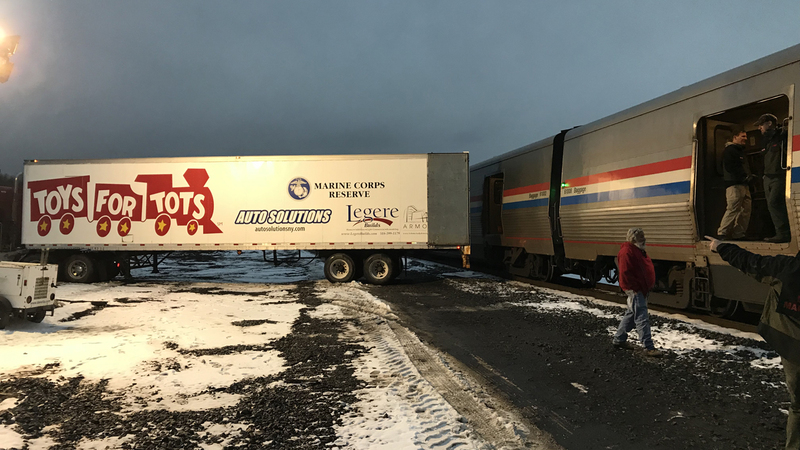 Last summer, after Amtrak denied the USMC request, an unnamed intermediary approached Levin and arranged a meeting with the Marine Toys for Tots staff in Albany. Levin did not say the Toys for Tots people were thrilled, but obviously they were. 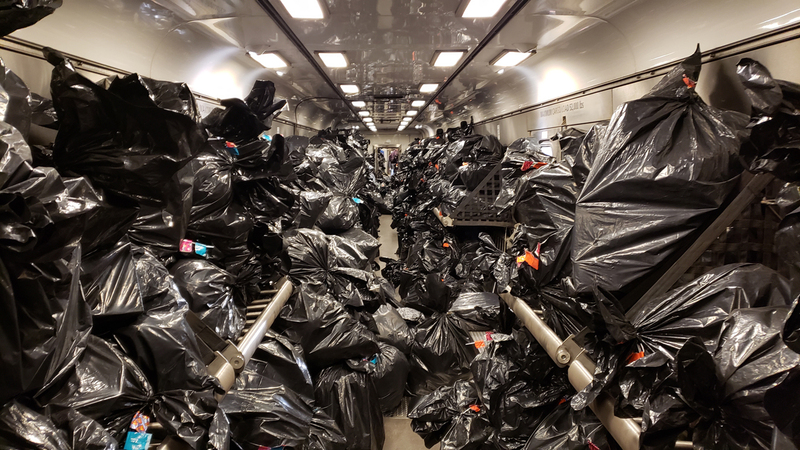 Eventually, Amtrak provided two baggage cars to store the gifts. That was just the beginning. 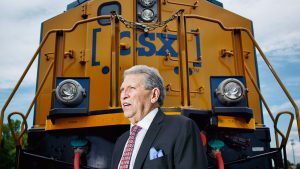 The greatest remaining concern was that Norfolk Southern would refuse to run the train (it owns the Southern Tier line, inherited from Conrail, originally the Erie). 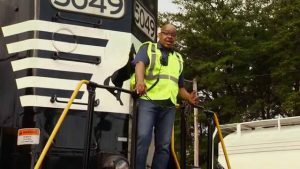 But Norfolk Southern agreed to run the train, and did so with great enthusiasm. The Marine Corps was lavish in its praise of Norfolk Southern, Levin and others who made the train possible. “On behalf of the Commandant of the Marine Corps, all of us associated with the Marine Toys for Tots program, but most important from the thousands of less-fortunate children who will benefit from this magnificent event, my sincere thanks to all who have made it possible,” said Pete Osman, the retired Marine lieutenant general who is president of the Marine Toys for Tots Foundation. 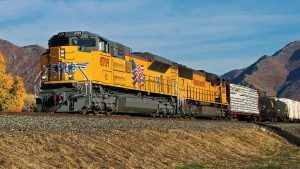 The train began its journey at Binghamton, N.Y., on Dec. 1 and made stops at Bainbridge, Oneonta, Cobleskill and Delanson. 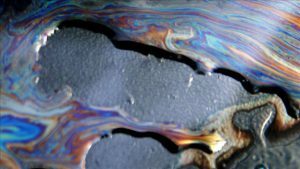 It served more than 160,000 children. Levin and everyone else connected with the train were not paid for their time and service. Levin, in an interview, asked why I hadn’t asked who would play Santa Claus on the train. I admitted I just hadn’t thought about it. There will be two Santas, he said, who will appear separately when children are around. 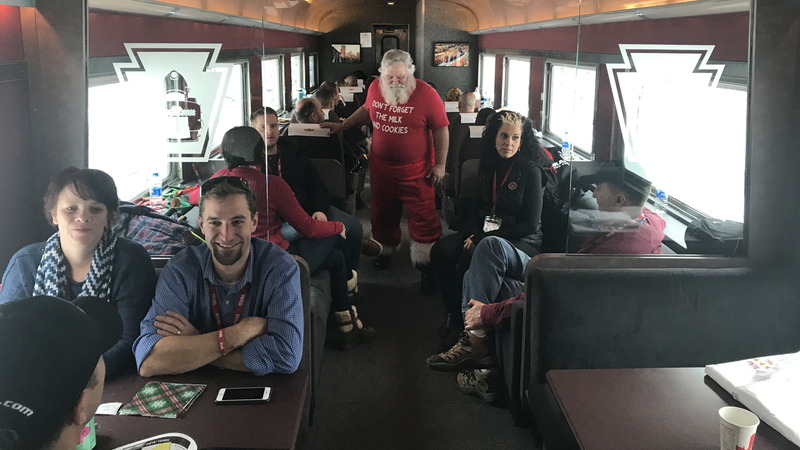 He didn’t know who one of the Santas would be, but he took delight in telling me one would be Ross Rowland, who provided the Bicentennial Train that toured America in 1976. Rowland volunteered for the fun of it. 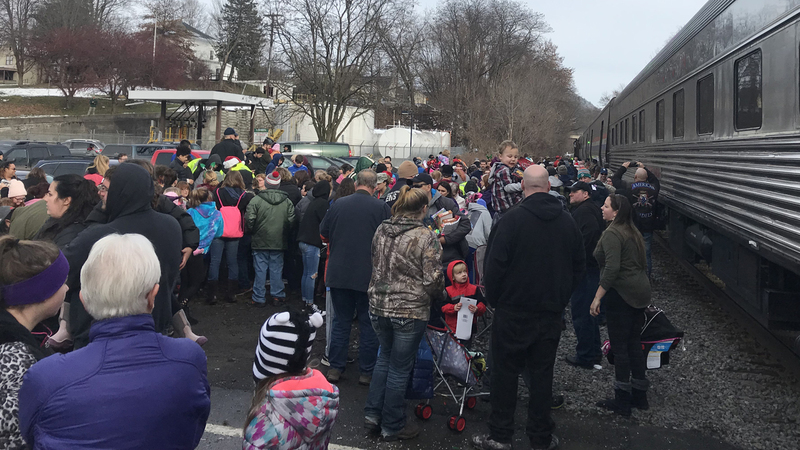 A lot of railroaders understood that if the Toys for Tots train didn’t run, the public would blame the railroad industry, including the freight railroads, since no passenger train runs along the Southern Tier route. Amtrak deserves the blame for canceling the train at the last moment and refusing requests to reconsider. Amtrak’s CEO probably will never understand how stupid and mean-spirited his decision was. 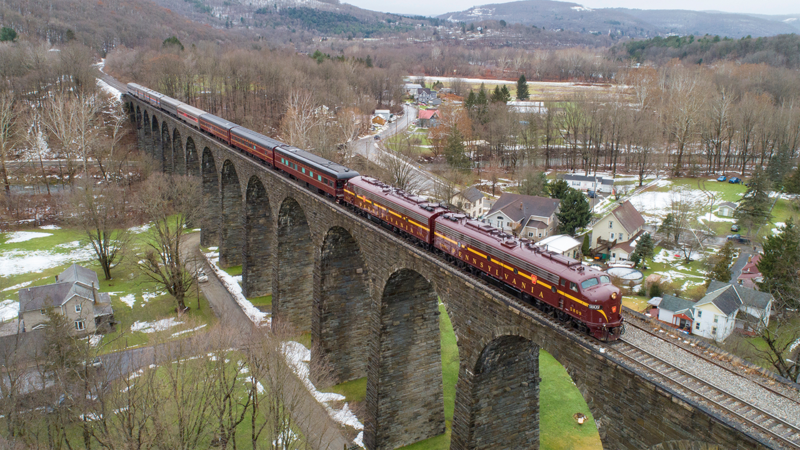 The Marine Toys for Tots Train homeward bound on Starrucca Viaduct. A Merry Christmas to All! Photos courtesy of Bennett Levin. Lumps of coal indeed! Either that, or the cold, cardboard-boxed Unhappy Meals Anderson has foisted on passengers on some long-distance trains. Then again, those boxes may have been used for an entirely different purpose, according to this report about a recent six-hour ordeal aboard a stranded Amtrak train. Holy sh_______!